The Battle of Princeton (January 3, 1777) was a battle in which General Washington's revolutionary forces defeated British forces near Princeton, New Jersey. The site is administered as a state park operated and maintained by the New Jersey Division of Parks and Forestry. On the night of January 2, General George Washington, Commander-in-Chief of the Continental Army, repulsed a British attack at the Battle of the Assunpink Creek. That night, he evacuated his position and went to attack the British garrison at Princeton. General Hugh Mercer, of the Continental Army, clashed with two Regiments under the command of Lieutenant Colonel Charles Mawhood of the British Army. Mercer and his troops were overrun and Washington sent some Militia under General John Cadwalader to help him. The Militia, on seeing the flight of Mercer's men, also began to flee. Washington rode up with reinforcements and rallied the fleeing Militia. He led the attack on Mawhood's troops, driving them back. Mawhood gave the order to retreat and most of the troops tried to flee to Cornwallis in Trenton. In Princeton itself, General John Sullivan forced some British troops who had taken refuge in Nassau Hall to surrender, ending the battle. Washington moved his army to Morristown, and with their third defeat in 10 days, the British evacuated New Jersey. 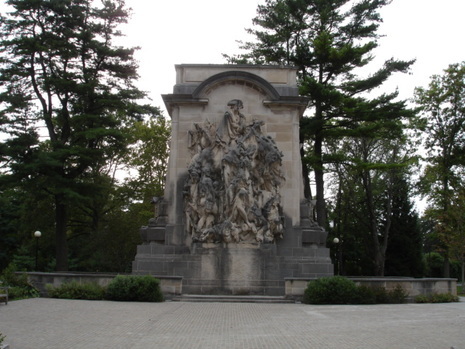 With the victory at Princeton, morale rose in the ranks and more men began to enlist in the army. The battle was the last major action of Washington's winter New Jersey Campaign. At year’s end in 1776, George Washington was motivated to strike again against British positions in New Jersey. He had surprised his opponents at Trenton on December 26 and in the following days hoped to build on that momentum. Washington also was acutely aware that the enlistment terms of many of his soldiers would expire at midnight on the 31st. On December 30, Washington again led his forces across the Delaware River from Pennsylvania into British-held territory in New Jersey. During the night and into the early hours of January 3, Washington dealt another masterstroke. He left 400 men in the camp to stoke bonfires and make digging noises as if they were preparing earthwork defenses for the coming battle. In actuality, a mass evacuation was underway. The bulk of the force silently departed, made a wide arc around Cornwallis’s sleeping army and headed north toward Princeton. The movement of American cannon was silenced by wrapping the wheels in cloth, and both soldiers and artillery were aided during the night as the muddy roads froze. Limited fighting occurred within Princeton itself. General John Sullivan and his men followed a small British force that sought refuge in Nassau Hall, the principal building of the College of New Jersey, later Princeton University. Sullivan trained his cannon on the building and, as legend has it, his second shot entered the building and decapitated a portrait of George II. The British soldiers promptly surrendered. Cornwallis missed these events. When he was alerted at dawn that the Americans had decamped, it was assumed that they had retreated southward and, being penned against the Delaware River, would become easy targets. Later, messengers arrived with word of events in the north. A livid Cornwallis and his soldiers immediately set out on the road to Princeton, where they faced the unpleasant task of fording the frigid and swollen waters of Stony Creek; the Americans had burned the bridge as they departed. Washington was faced with a crucial decision. The aggressive side of his character wanted to march directly on the British regional headquarters at New Brunswick, which held ₤70,000 in silver and a huge store of supplies. His more conservative side, however, realized that Cornwallis was in pursuit and that his own army was exhausted. The latter prevailed. He and the Continental Army headed for Morristown, arriving on January 5 and 6 to establish its winter quarters. Cornwallis retired to New Brunswick. * On January 1, 1777 the British had been in control of New Jersey and were in a position to take the prize of Philadelphia, if they so chose. Several days later, the seat of the Continental Congress, recently deserted by the delegates, was safe and the British presence in New Jersey was confined to a small area in the northeastern corner of the state. This remarkable turnaround greatly increased American morale. * The experience of the twin victories helped Washington to grasp how to fight the war most effectively. The main body of the British armies was to be avoided; attacks were to be made on smaller forces in outlying areas, a strategy that made it difficult for the British to extend their control over broad expanses of territory. * The results of Trenton and Princeton were noted in France. Britain’s great international rival was not yet prepared to enter the war on the American side, but had been encouraged enough by the recent events to extend badly needed supplies to the rebels. On January 3, at 1:00 A.M., the rest of Washington's force set out, with secrecy and silence being maintained. The wagon wheels were wrapped in rags to prevent them from making any noise. the 4,600 men began marching east along Sandtown Road in a broad arc across Miry Run and then northeast on the Quaker Road toward Princeton. Washington ordered Brig. Gen. Hugh Mercer and 350 infantrymen to act as a blocking force 2 miles southwest of Princeton on the Post Road at Stony Creek Bridge. Mercer's objective was to prevent Cornwallis or Leslie from reinforcing Mawhood and to prevent an escape from Princeton toward Trenton. With Mercer in place, Washington intended to move his force north and east along the Back Road and rapidly close on the 1,200-man British garrison at Princeton. Around 8:00 A.M., Mawhood was marching his 800 men to Trenton to join up with Cornwallis. In the morning fog as he was drawing near Stony Creek, Mawhood spotted Mercer's force to the south marching northeast toward the bridge to take up his blocking position. At first, Mawhood thought that Mercer's column was a Hessian column. Mawhood soon realized that they were Americans. Mawhood's force fell back to a defensive position and the two forces met at Clark's Orchard. Both sides deployed quickly into line and began opening fire on one another at a range of only 50 yards while unlimbering a pair of field pieces each. After his men fired only one volley, Mawhood ordered his men to make a bayonet charge. The militia panicked and retreated south toward the Back Road. During the assault, Mercer was mortally wounded, including seven stab wounds. Washington moved forward with Cadwalader's Pennsylvania militia to prevent a complete rout of their forces. Washington, Cadwalader, and Maj. Gen. Nathanael Greene then moved among the troops to rally them. Washington rode into the middle of the battlefield and rallied the fleeing militia. When Mawhood spotted the head of the new Patriot reinforcements arriving on the scene, he fell back and took up a defensive position. 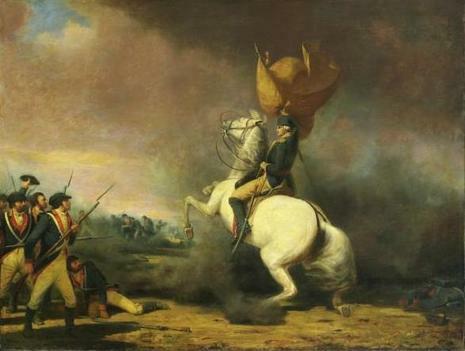 Once the main body of his force had moved up, Washington led his men against the British line. At a distance of 30 yards, he halted and ordered his men to attack the British. Knox was able to bring up his cannon force and joined in the fight. The combined Patriot attack nearly enveloped Mawhood's infantry before breaking his line. The British troops broke and some headed to New Brunswick while the rest, including Mawhood, broke through the lines and headed for the bridge and Trenton. The Patriots chased the fleeing British and captured 50 prisoners before Washington recalled them and continued advancing toward Princeton. The rest of the action consisted after the British retreating through the town and then northward as the Americans moved behind them. Cornwallis had heard the fighting begin and hurried to bring up reinforcements from Trenton, but the last Americans were slipping out of Princeton as the first of Cornwallis' troops were arriving. There was a 200-man force that had barricaded themselves in Nassau Hall, a thickly walled building that served as the College of New Jersey. The Americans fired two cannon shells into the building and then made a charge, forcing the British to surrender. Washington was unable to occupy Princeton because of he knew that Cornmallis would be counterattacking soon. He wanted to push on to New Brunswick, but his troops were too tired. Washington left a detachment of soldiers to destroy Stony Creek Bridge, which would delay the British army. Seeing the bridge gone, Cornwallis sent his men across the icy stream and pressed ahead. The British vanguard spotted the withdrawing Patriot force but was unable to catch up with them.